Do you assist a loved one living at home with everyday tasks, for example eating and getting dressed? Your friend or relative might need assistance for example due to old age, disability or long-term illness. If your friend or relative is in constant need of your assistance in order to get by at home, you have become a caregiver. 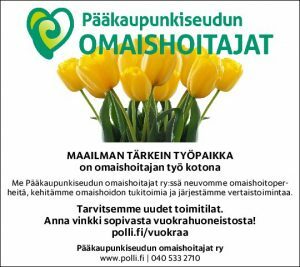 The Associaton of Carers in Helsinki and Vantaa provides support for caregivers in Helsinki and Vantaa regions. Families in which caregiving is needed should receive adequate support and enough means to maintain a sustainable everyday life. We offer information on caregiving in various languages, plus free counselling and guidance services for caregivers. If needed, counselling can also be provided with the help of an interpreter.